As the professor of a class called Emergent Media Production, I have resigned myself to regularly updating and reinventing the class. Emergent media is – by its very definition – always emerging. In the past six years, we have explored locative media, webisodes, Arduino, iBooks, Twine storytelling and augmented reality books. What are we up to this year? We’re filming 360° spherical video. The project started a year ago – in Fall of 2016 – with the One-Shot-Wonder Assignment, a 360° “test run” conducted towards the very end of the semester. Students used Ricoh Theta S, a basic camera that automatically stitches together footage from its two built-in fish-eye lenses. No postproduction required. And in this assignment: No postproduction allowed! But while the tech may be (relatively) easy, designing good content for the 360° format is not! We stumbled into both unexpected obstacles and exciting avenues for future exploration. Media-makers used to traditional production will immediately want to know this: Where can we hide the production equipment? Light kits? Boom operator? What about the tripod? Lights and mics have to be hidden on set. Crew can either hide behind furniture or double as on-camera extras. But we had to work a bit harder to answer the tripod question. Looking directly down – within a 360° view – means looking directly at the tripod. And without advanced postproduction, there’s no way to avoid that. So what can we do? The Emergent Media Production students – in this first one-shot experiment – proposed two solutions. You can’t hide the tripod. So make it part of the story world. There’s no need to hide production equipment if production is part of the story world. Two students filmed a rehearsal of Temple Smash!, the student-run comedy show. Their footage captured not just what was being filmed on camera but also the hard-working crew and off-screen voice talent… now no longer “off-screen.” And in the video above, Alexis Johnson – a student reporter for Temple Update – controlled the 360° camera from a cell phone on her lap while she anchored the student-run news show. Looking “up” and “down” can often be a letdown in 360° video: Seeing a tripod breaks the cinematic illusion and witnessing an empty ceiling makes the expansive quality feel gratuitous and unnecessary. In the studio, however, the look up revealed a dynamic light grid and the look down revealed a tripod, yes – but in this case, both elements added to the misé-en-scene, pulling viewers into the story world rather than pushing them out of it. You can’t hide the tripod. So don’t use one. The Ricoh Theta S cameras are not big and they are not heavy. They balance easily on flat surfaces. One student placed the camera on a board game, and filmed her family playing the game. The camera became like a game-piece, and this camera perspective added charm to the work. Another student also used a game, this time placing the camera on the box top. A group of friends performed around the camera, ultimately posing in a ‘mannequin challenge.’ The project truly presented a visual wonderland: All angles were fun and entertaining, worth the viewer’s attention. Looking around showed friends in costumes with props, posing “mannequin” style around the room. Looking “up” exposed flashing lights on the ceiling and looking “down” showed magazines and games – all natural parts of the misé-en-scene. There were no bad angles, no unconsidered viewpoints. And… no tripod! The video opens with viewpoint oriented out the windshield. 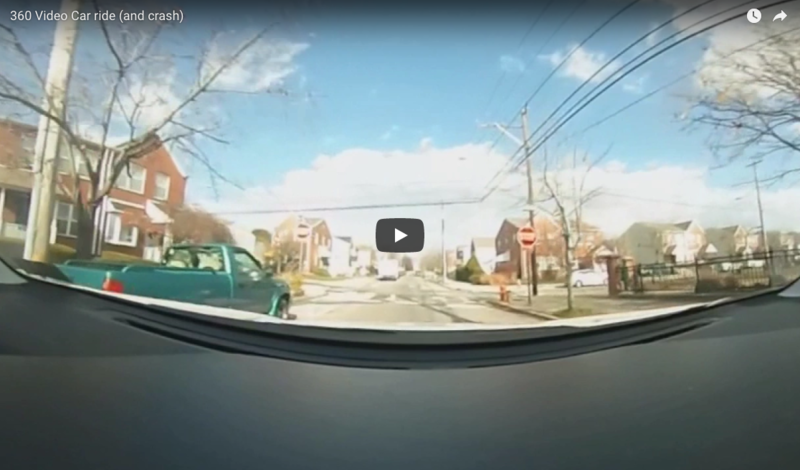 This view is familiar to anyone who has ever been in a car, and the opposing view – the view of the driver – is likewise familiar to anyone who has ever seen a movie or TV Show scene filmed in a car. However, this familiarity is countered by the uncanny ability to do an Exorcist-like head-twist between these two angles of view. And because looking away from the road would normally pose grave danger, invitation to swivel is especially unnerving. The camera motion in this video feels natural. 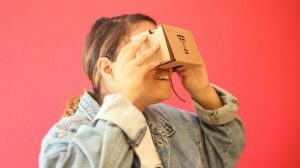 One potential frustration when viewing 360° video content is the inability to move. You can look in any direction, but you can move forward in none. The smooth motion of driving eases this concern. These were only some of our discoveries… more coming soon in Results of the One-Shot-Wonder Assignment, Part 2! Please join us to see the Fall 2017 360° student videos! Laura Zaylea teaches traditional and emergent media production in the Department of Media Studies and Production, Klein College of Media and Communication, Temple University. Upcoming 360° courses include Dublin 360: International Urban Storytelling (Summer, 2018; more information here ) and Emergent Media Production (Fall, 2018). More about her teaching and creative work can be found at www.LauraZaylea.com, and you can reach her any time at Laura.Zaylea@Temple.edu.